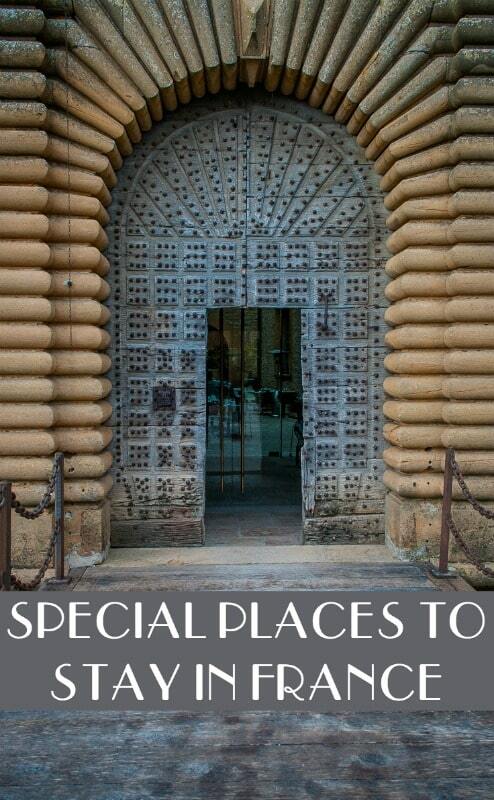 There are nice places to stay in France, there are great ones, and then there are special places to stay. The 13th century Chateau de Bagnols, fell well and truly into the latter. 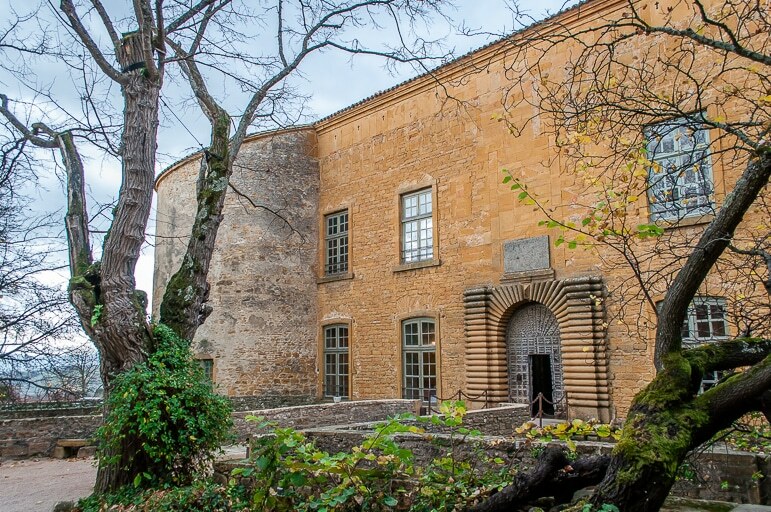 The castle has stood proud and purposeful for the last 800 years in the southern town of Bagnols in Beaujolais, and today it is open to guests. The castle has had a recent renaissance after falling into disrepair after standing empty for 200 years. 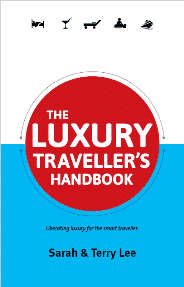 It was purchased in 1987 by Lord and Lady Hamlyn, British peers, philanthropists and publishers. 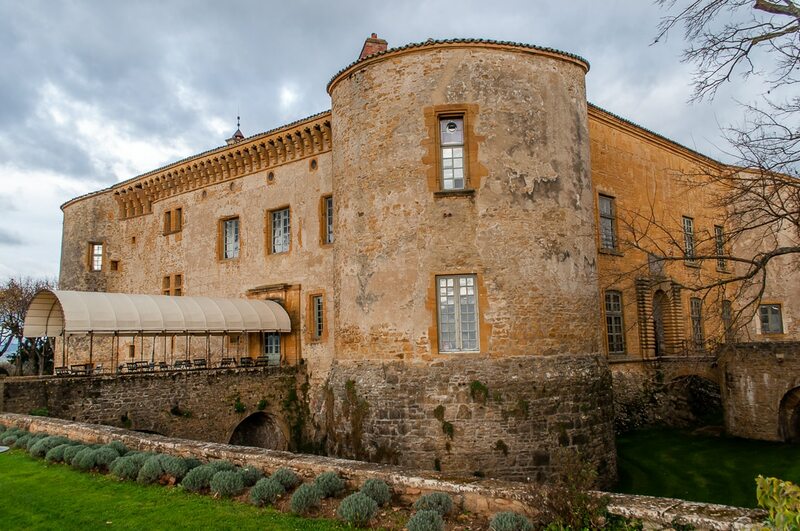 Following its purchase Chateau de Bagnols underwent extensive renovation. It took four years of restoration to turn it into the magnificent building it is today, and in 1992 with the work completed, it opened as a five-star hotel. 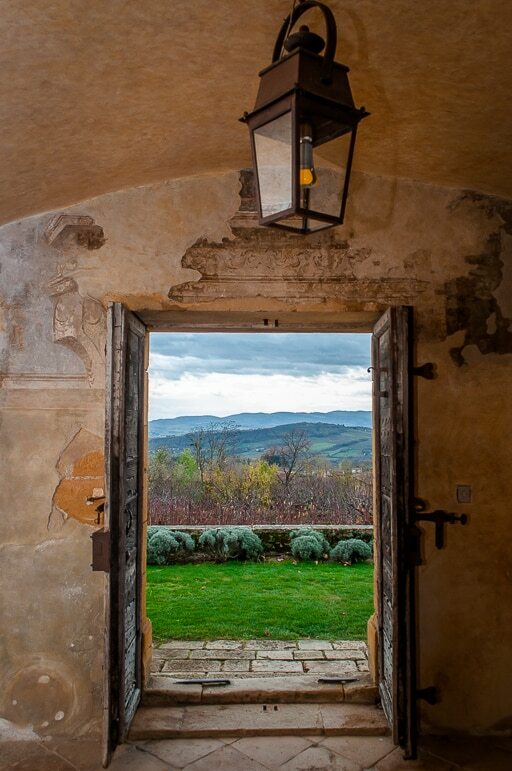 To stay at Chateau de Bagnols is to experience more than just wonderful accommodation, it is to embrace history. 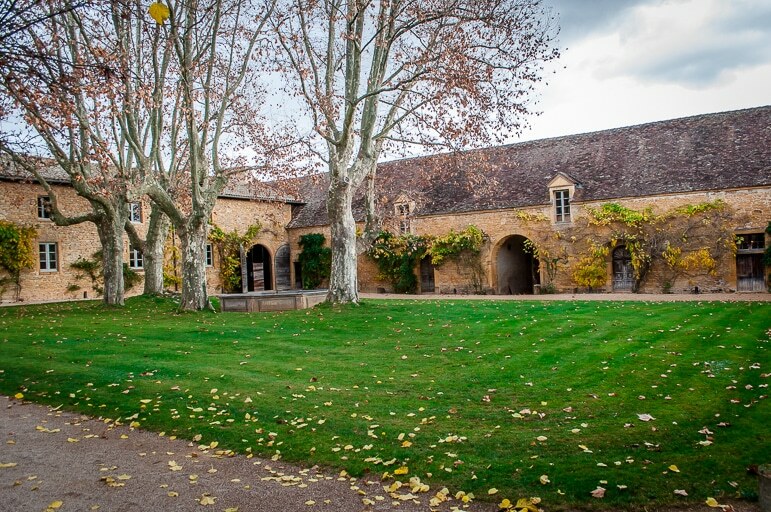 Merely walking around the castle and its grounds you will gain insights into French culture, art and history. The former castle is an intensely impressive sight as you approach its huge walls, mediaeval turrets, moat, and a drawbridge reinvented as the hotel’s entry. 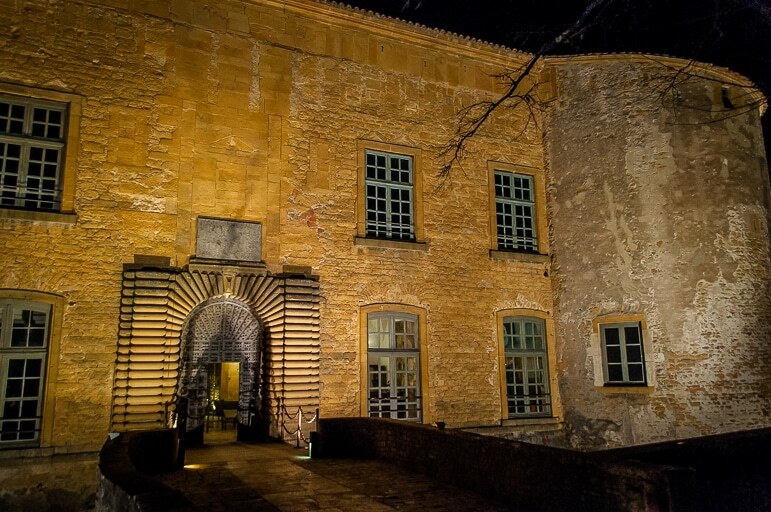 Once inside the commanding walls of the chateau, the atmosphere is one of tranquillity and elegance – it feels like one of those very special places to stay at in France. 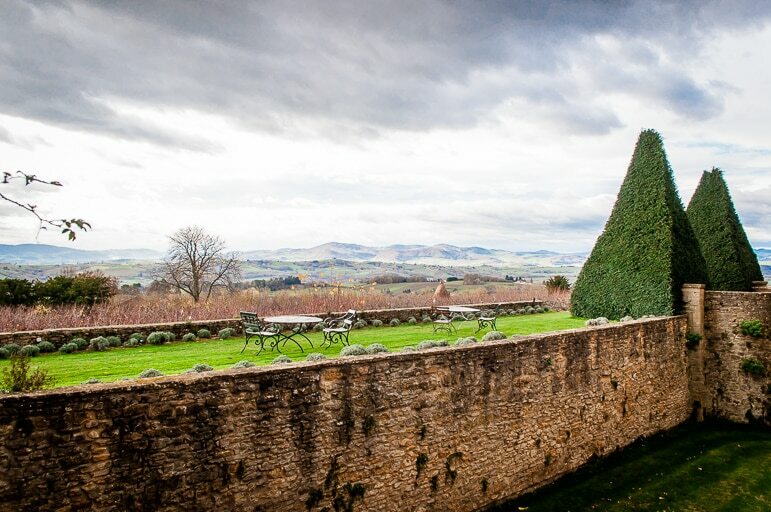 Looking out over gorgeous gardens, the hills and vineyards, Château de Bagnols, built with the local golden stone, which the surrounding town is also largely constructed of, represents quintessential France. 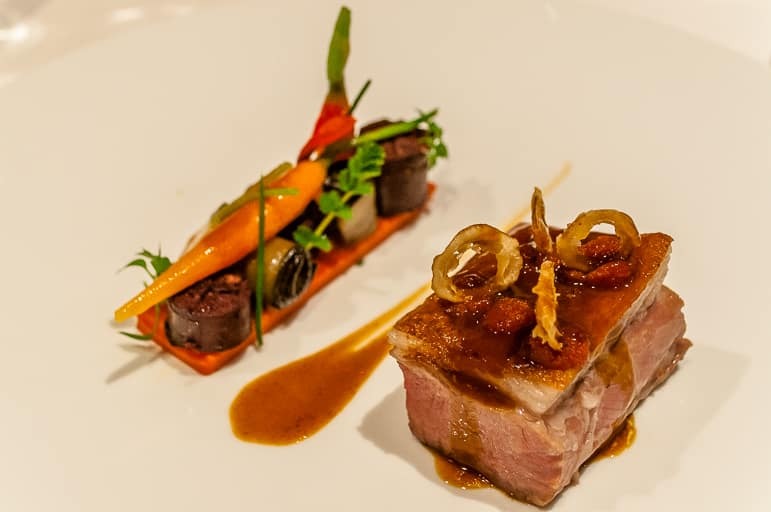 Dining at Chateau de Bagnols is a high point of any stay. Its main restaurant, 1217 in the castle’s former guard room is an occasion, and a history lesson. It has a monumental gothic fireplace, the biggest in France, and during the French Revolution was a meeting place for revolutionaries to plot and scheme about bringing down the establishment. Today though the surroundings remain historic, the ambience of 1217 is more refined. 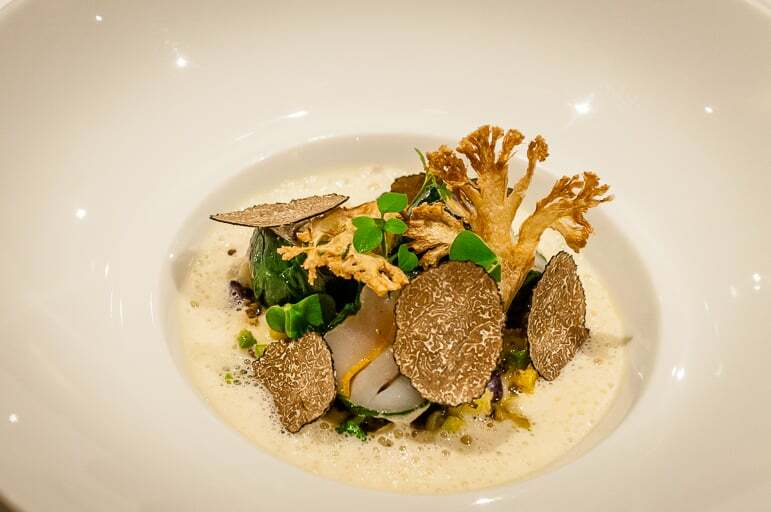 The restaurant serves a gourmet menu and we dined in fine style. 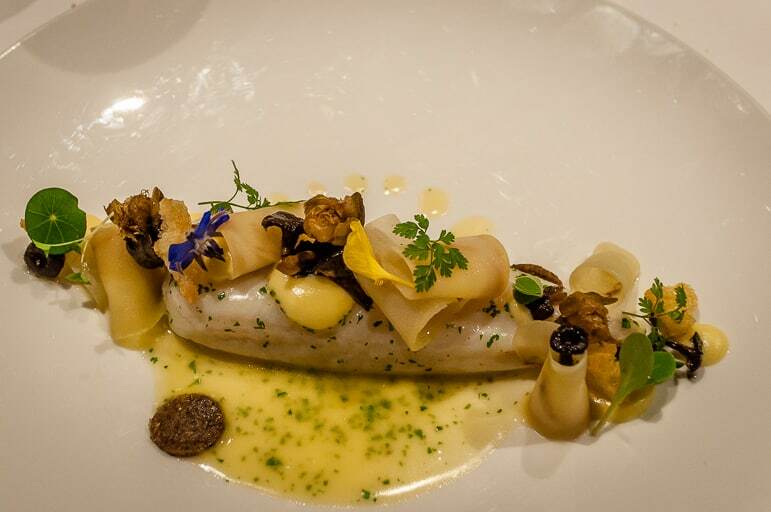 My starter was roasted scallops, vegetables, autumn truffle and white Beaujolais emulsion, this was followed by delicately cooked sole, creamy potatoes and chanterelle mushrooms. For dessert I chose the saint honoré cake with vanilla coconut. The restaurant’s wide-ranging cheese board proved my undoing and as delicious as it was, I could only manage two small samples, of Reblochon and fiesty Époisses. 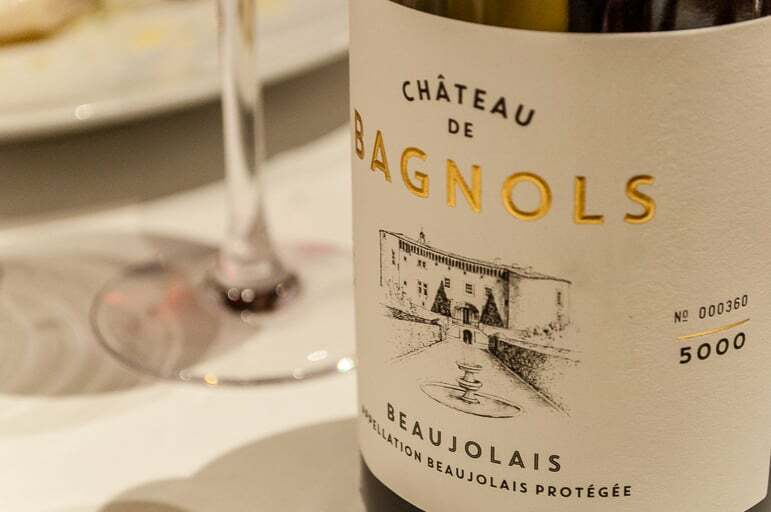 The hotel wine list was extensive, however we chose a bottle of the hotel’s own Beaujolais – a 2013 Chateau de Bagnols – it seemed rude not to, especially as there were only 5,000 bottles in this vintage. 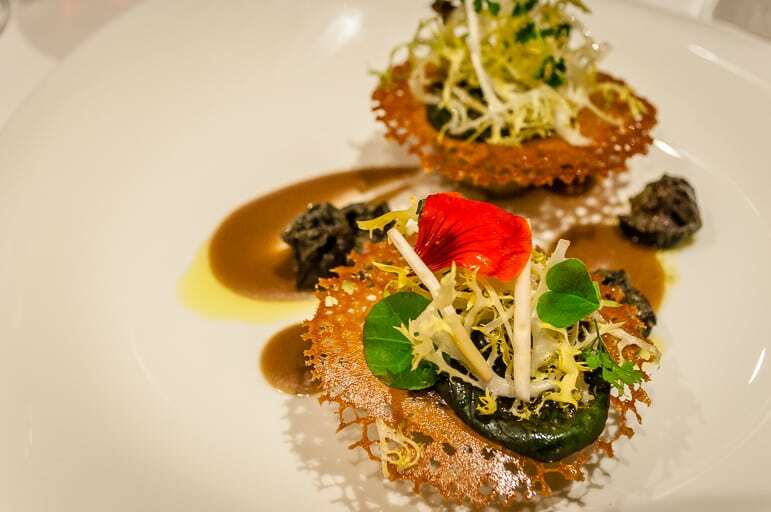 Its dark red cherries and soft feel complemented the meal beautifully. 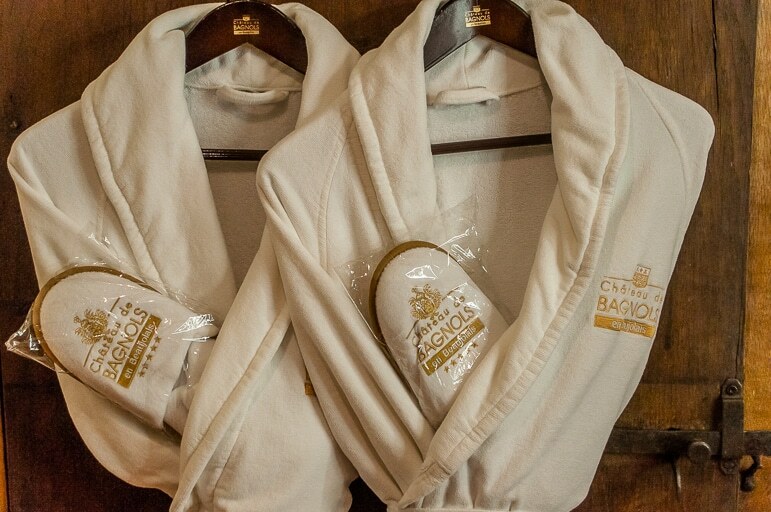 As we visit many hotels we know there are suites and then there are suites, however the rooms at Chateau de Bagnols are a testament to its historical authenticity. 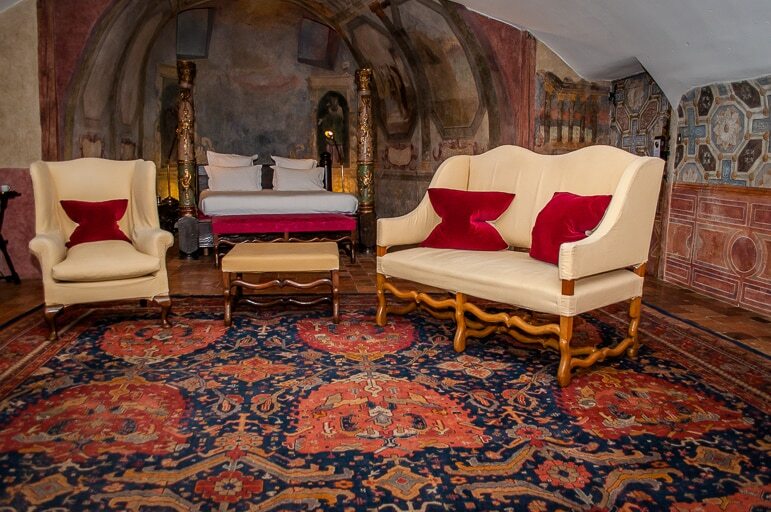 They are decorated with lavish furnishings, original centuries-old murals and a wealth of antiques. 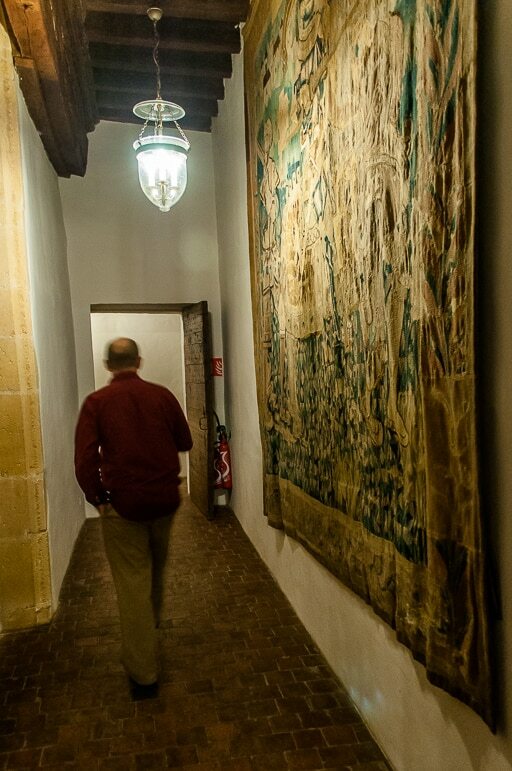 Even the corridors are festooned with tapestries and yet more murals. The nearby city of Lyon, was once known for its silk production and Chateau de Bagnols has clearly made great use of the fabric. It is no wonder that the castle has been listed since 1986 as a French Historic Monument for its architectural and historic significance. 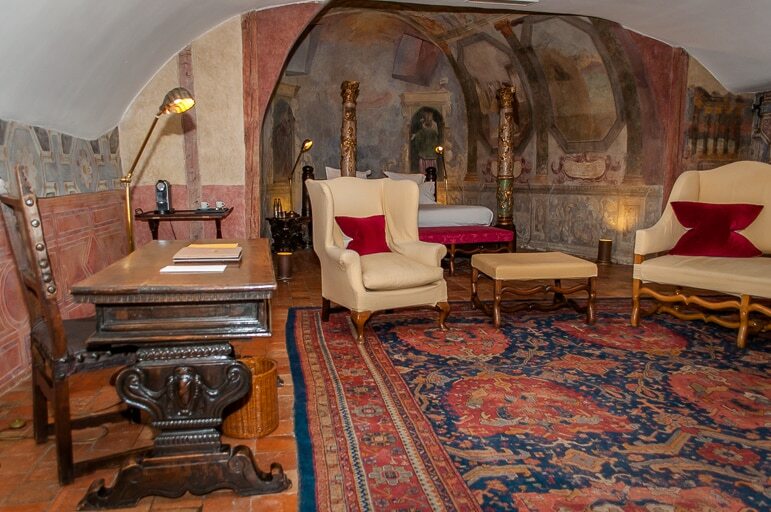 Our wonderful suite was a former chapel, named Gaspard Dugue, after a man who bought the castle in 1619. 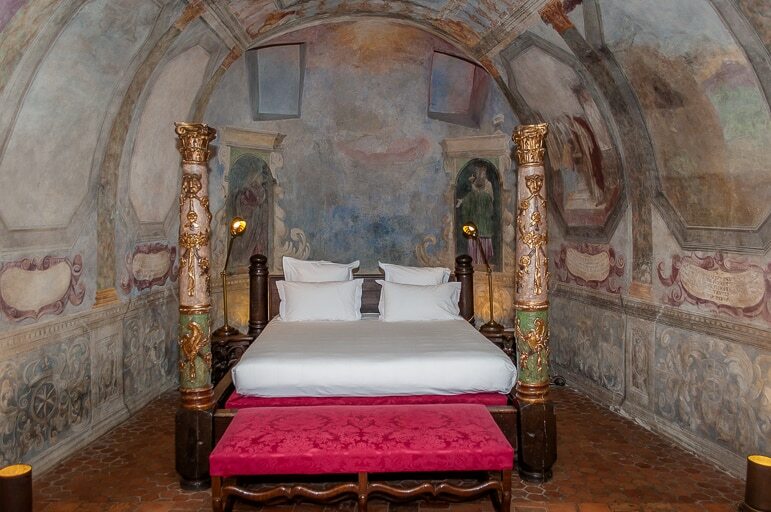 Its four-poster bed was set back into one of the castle’s towers, where the faded glory of 15th century murals provided the most historic character we’ve ever experienced in a luxury hotel stay. There was an abundance of seating with chairs and sofas and a writing desk with a chair in the living area of the suite as well as a mini bar, huge dressing table and a separate dressing room. 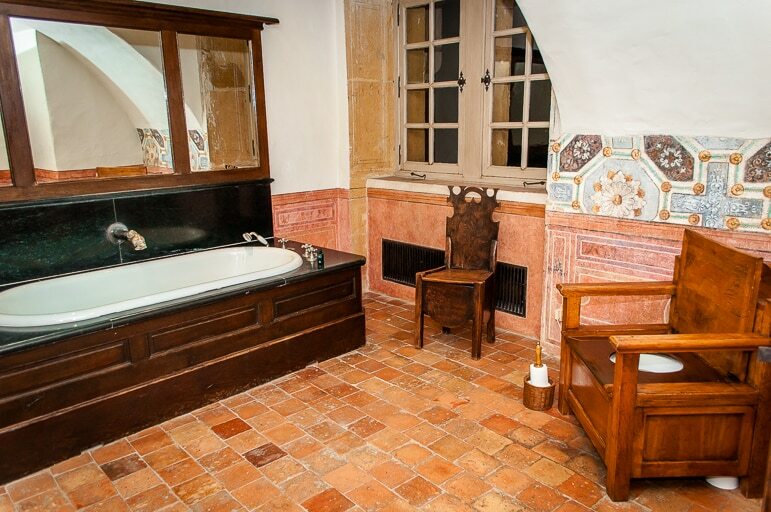 The large bathroom was equally impressive and for good measure the toilet had to be pointed out to us as it is hidden beneath a large wooden commode type chair. Just another of this wonderful hotel’s quirks. 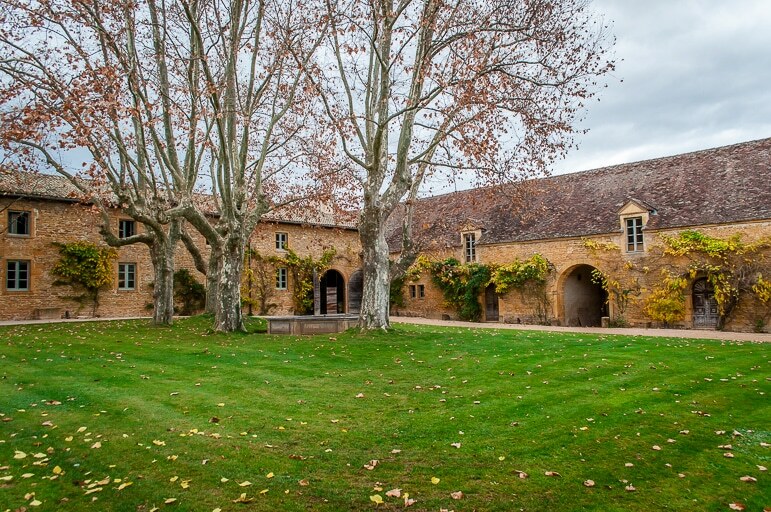 But it’s not all quirks and no substance, Chateau de Bagnols also has a very modern well-being centre. As spa aficionados we can’t resist a day of pampering wherever we are staying, so in the interests of hedonistic pleasure we paid a visit. Stepping into the spa reception the calming atmosphere engulfed us and resistance to relaxation was thankfully impossible. We were booked in for treatments, mine a full body massage and Sarah was having a facial. Our welcoming therapists Marion and Maeine were attentive and gave very professional treatments in lovely surroundings. 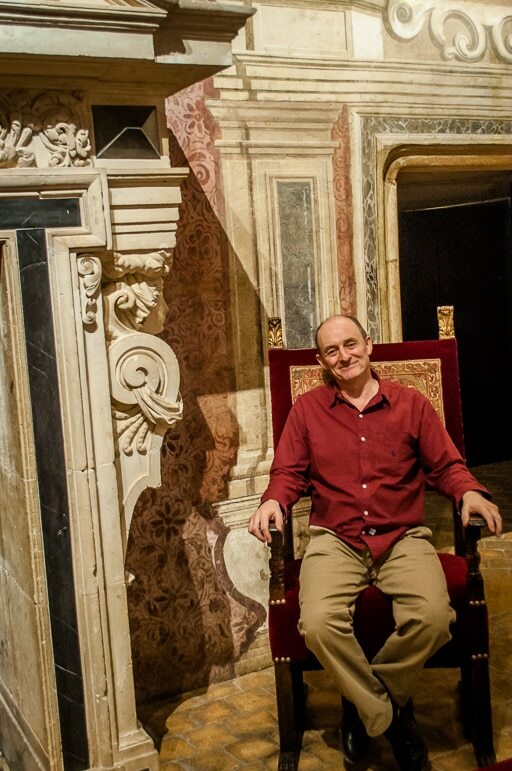 It was thought-provoking to be in a place of such rich classical history, yet be surrounded by modern five-star facilities. The well-being centre has an indoor pool, gym, hammam, and relaxation area. There is also an outdoor swimming pool which we were informed was installed when a certain famous guest requested it – actor Tom Cruise and then wife Nicole Kidman, obviously have some influence. They are just some of the famous names to have stayed at Chateau de Bagnols, others include Hilary Clinton and Barbra Streisand. The characterful Chateau de Bagnols is an oasis of serenity amid timeless quality, modern facilities, and elegant countryside. As regular travellers it takes a lot to impress us, but Chateau de Bagnols did so on a grand scale, and as one of those special places to stay, I have to say it was simply magnificent. We were in France to take part in the celebrations for Beaujolais Nouveau Day, the official launch for this year’s Beaujolais Nouveau. You can learn more about the French wine region here. We visited Beaujolais with French Tourism, as usual all views, and delusions of grandeur after our chateau stay are our own.